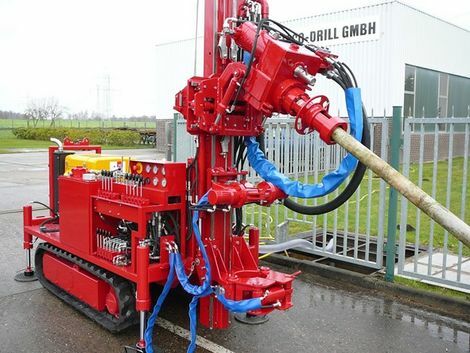 The drilling systems and equipment of the company Wellco-Drill have been a trademark for quality, longevity and reliability that’s made in Germany for decades. The company currently manufactures its products with a team of 23 employees at its location in Stendal (Saxony-Anhalt). Over the next few years, Wellco-Drill intends to intensify its commitment to both well construction for groundwater extraction and drilling for the exploitation of geothermal heat/geothermal energy. Wellco-Drill is one of 30 companies to have been nominated for this year's Prize for Small and Medium-sized Businesses. In the company’s large production hall in Stendal, things are very loud and busy indeed. "In our machine park we have both conventional and modern equipment, CNC-controlled lathes, as well as systems for machining and welding," explains Frank Lösche, Managing Director of Wellco-Drill GmbH in Stendal. Structural steel construction work is the company’s key area business – from the cost-effective, individual production of components, to the repair of construction machinery, through to complex series manufacturing. Taking specialist customer requirements into account during the construction work is all part of the services to be offered by Wellco-Drill. In addition to the company’s design engineers who have decades of experience, a new designer fresh from the Wernigerode University of Applied Sciences has recently joined the team, bringing the latest knowledge of the world of industrial design into the Stendal company. Wellco-Drill was founded some 38 years ago in Celle, Lower Saxony. Drilling equipment for well construction has been the company’s key area of business right from the start. At that time, the systems were manufactured almost exclusively for the development aid work carried out by the UN and the German Association for Technical Cooperation GmbH (Deutsche Gesellschaft für Technische Zusammenarbeit GmbH / GTZ), finding use in Africa and South-East Asia. In 1992, the takeover of the Stendal-based company Industrie und Bohr GmbH, a company that was formerly active in geological research and the manufacturing and supplying of equipment to the deep drilling industry, occurred. Following the sudden death of the company’s founder, who hailed from Beedenbostel, the business then became insolvent. “In December 2015, we rescued the Stendal-based company from insolvency, along with its staff team, consisting of ten employees,” explains Managing Director Frank Lösche. The company now has more than twice the number of staff, including three apprentices. The new start also represents a return to the company’s roots, supplemented with the latest technology of the Industry 4.0. “We want to focus on the manufacturing of drilling equipment for well construction, and in the future, we also want to focus on the use of geothermal heat/geothermal energy,” announces the Managing Director Wellco-Drill. With its current range of products, the company will be attending this year’s Hanover trade fair, where it will share an exhibition stand (hall 4, stand G 05) with other businesses from Saxony-Anhalt. Its range of products includes drilling systems weighing between 3 and 20 tonnes with which groundwater can be extracted from depths of several hundred meters. Wellco-Drill is currently preparing to expand and revitalise its customer relations at both home and abroad – a task with which international sales partners in Austria, Denmark, Norway, the Netherlands and Hungary are helping. The company also has specific plans for larger well-drilling systems in Chile and Serbia. Wellco-Drill is also developing a customised drilling system for the construction of one of the largest water production facilities in the Balkans. In the face of global population growth and climate change as well as the limited availability of surface water resources, the UN believes that clean groundwater is to become an increasingly important resource for people all over the world. With the use of innovative water drilling equipment, the Stendal-based company Wellco-Drill wants to contribute to improving the supply of drinking water in developing countries in Africa and Asia.